Let’s take a walk on the wild side and say that Jesus giving his disciples the Christian faith is kind of like Jesus giving each of his disciples a brand new Batmobile. That’s right, a jet-black, megacool, ridiculously powerful supercar just like Batman had in all of his movies, but with even more amazing high-tech gadgets and capabilities. Except this Batmobile can go anywhere—up a mountain, across the desert, heck it can even convert into boat mode and drive over the Sea of Galilee. It has no need for expensive gas, it runs on Christ’s grace, baby! And do you remember how in the second Batman movie, with the push of a button the car could convert and become super skinny to squeeze through alleyways and stuff? Well, this Batmobile is even more amazing… with the push of a button, the entire car splits in half and miraculously duplicates itself! One moment, you could have the only Batmobile in town, and minutes later the whole neighborhood could be cruising up and down the street in their own brand new ride! Pretty sweet, huh? And so, as he was about to return to his Father in heaven, Jesus commanded the Apostles to go out and make disciples of all nations, giving the Batmobile to as many people as they possibly could. And that’s exactly what they did. They began in Jerusalem, sharing the Batmobile with over three thousand people in one day (beat that, General Motors! ), and soon people throughout Israel and even throughout the entire Mediterranean were driving it around! And it has been passed down intact from generation to generation until the present day. Sure, over the centuries its external appearance has changed a little bit, and we have gradually come to a deeper understanding of certain aspects of it, but the Batmobile we’re driving around today is still the same exact one that St. Peter and St. Paul and all the apostles were driving around 2000 years ago. Jesus is still working through it, helping us to zip down the road to eternal life by knowing, loving, and serving God. Because that’s the purpose of the Batmobile: to help us down the “Highway to Eternity” by knowing, loving, and serving God, so that one day we can experience the joy of heaven. Jesus knew that the Highway to Eternity is a difficult road, filled with obstacles and dangers and enemies that can cause us to forever lose our way, so in designing the Batmobile he spared no expense! He gave it a special GPS guidance system to guide and direct us along the right path (Christ’s guidance through the leaders of the Church). He installed bulletproof armor that strengthens us against the attacks of our enemies (the sacramental grace of Baptism and Confirmation), a built-in mini-fridge that nourishes us along the journey (the Eucharist), state-of-the-art first-aid technology that heals us when we are hurt (Confession and Anointing of the Sick), and countless other features to help us on our journey to heaven. 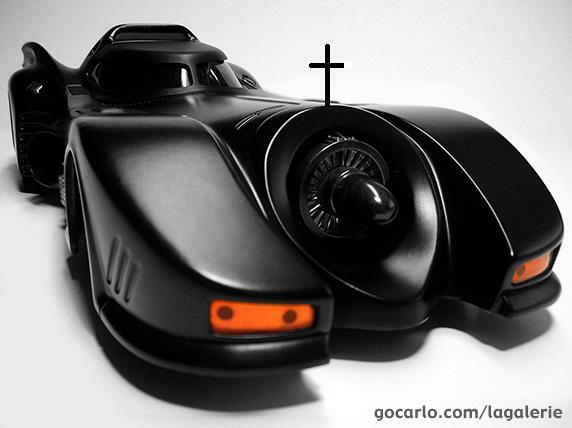 Jesus wants everyone to have these awesome gifts, but he does not force the Batmobile upon anyone. We might ask, what does that mean about the other religions—Judaism, Islam, Buddhism, etc? Well, if Christianity is like the Batmobile, then Judaism is, say, like traveling down the Highway to Eternity in a horse-drawn buggy (they’re still waiting on the engine!) And the other religions, they would be something like riding on a camel or a bicycle or walking on foot. God is all-powerful and can help a person to know, love, and serve Him even in these circumstances, but it is going to be a much more difficult and treacherous journey for them than if they had the Batmobile. He wants them all to have that gift, because it is only in Christianity that they will have the fullest and deepest experience of His fatherly love and care. That is why we are called as Christians to evangelize by word and deed, to help the entire world come to know Jesus Christ. We want every single person on earth to experience the joy of knowing Christ and becoming an adopted child of God! And what about the other Christian groups around us—the Lutherans, Presbyterians, Anglicans, Methodists, Baptists, and all the rest? Where are they along the Highway to Eternity? Basically what happened is that five hundred years ago, a monk named Martin Luther and several other leaders each started churches that broke away from the Catholic Church and its fifteen-hundred-year-old faith. With the very best of intentions, believing that they were restoring the Church to how God meant it to be, they each decided that they wanted the Batmobile their own way. They decided that they didn’t need its GPS guidance system, they got rid of the bulletproof armor, they tossed out the mini-fridge and the first-aid, and so on with many of the things that make the Batmobile so cool. In other words, with all the best of intentions, the Protestant Reformers turned the Batmobile into a Ford Taurus or a Kia Sophia! The engine, Jesus Christ, is still intact, so they can still travel down the Highway to Eternity pretty darn well (much better than any camel or bicycle!) But nonetheless, God still wants them to have all of the gifts that He gave his apostles two thousand years ago! He doesn’t just want them driving a Taurus or a Sophia, as nice as they are, He wants them to be enjoying the Batmobile! That is why we are called, as Catholic Christians, to evangelize not only non-Christians but even our non-Catholic brothers and sisters in Christ. It’s not that they don’t know and love Jesus, it’s simply that we want them to experience the fullness of the Christian faith, all the gifts that God wants to give them through his holy Church! « Is heaven on earth boring?